Whited Sepulchre’s split series—which has already been kind to Salt Lake City ambient artists—continues by linking up two musicians from Australia and Utah. 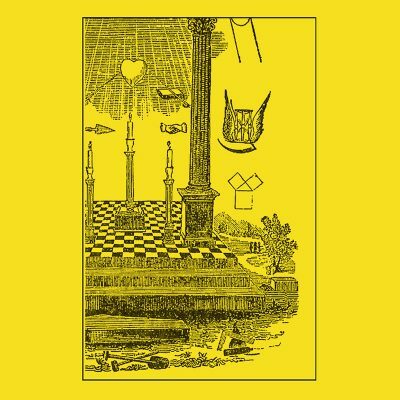 John Atkinson (previously of Aa) and Willow Skye-Biggs (here as Sabriel’s Orb, formerly Stag Hare) make up the respective sides of the cassette, and the result is the most immersive and pleasing Whited Sepulchre split so far. Atkinson’s contributions favor texture and atmosphere over melody. His first track, “Backwaves // Rye,” immediately opens in a swirl of tones. While there is harmonic motion, it doesn’t seem to follow a set progression. Synthesizers fade in and out, naturally ebbing to make room for the next in a never-ending series of chords. The concept firmly actualizes when these instruments fade out into a recording of flowing water from Atkinson’s home in Australia. Atkinson continues this approach on “First Rain of the New Year,” merging pristine field recordings with a purposefully convoluted, instrumental backdrop. For almost half of the track’s nine-minute runtime, there’s little more than the quivering swell of a single sound littered with bird calls. Even when the palette starts to expand toward the back half, it does so minimally and without sacrificing the unitary nature of the composition. Though Skye-Biggs’s music is built out of similarly warm and dreamy synthesizers, her relationship to development is entirely different. Her first track “Secret” is simple in its construction. A quiet hum, a steady one-note pulse and a three-note melody take up most of the 10 minutes here, but Skye-Biggs uses subtle gestures like an extra chord tone or shift in repetition to retain the track’s forward motion. “Holding” offers more of the same, but with a greater conflict between clarity and a muted mix.